The smell of spring is everywhere. A whiff of jasmine is in the air. The breeze carries the gentle scent of violets. The aroma of cedar, oriental woods and spices encourages you to dream. Patchouli ad musk stir your blood and enhance your appetite for life. The smell of fresh mint, orange and lemon brings summer into your home and heart even in winter. The powerful aroma of ambergris combined with grapefruit, ginger and green pepper evokes thoughts of faraway places full of mystical charm. Pheromones increase self - confidence and desire for love. 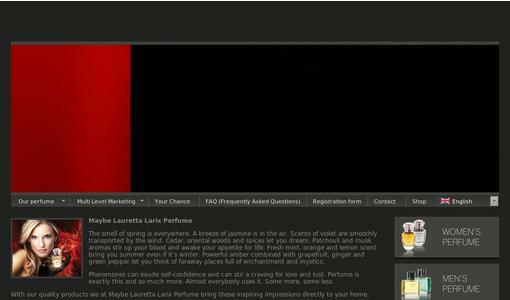 The high - quality fragrances of Business Lauretta Larix Perfume will enable you to convey these inspiring impressions to your customers and make your brand / company / product better known. Perfumes are Classified Into 5 Types: Perfume, Eau de Perfum, Eau de Toilette, Eau de Cologne and Eau de Solide. Perfume is the most valuable product because it has the highest percentage of aromatic compounds. The concentration of aromatic oils ranges from 15 to 30 percent. Bsiness Lauretta LArix Perfume sells only such high - quality perfumes. Their scent is long - lasting so they can be applied sparingly. Since 2009, we have been selling worldwide high - quality perfumes for women and men. We offer our customers the excellent price- performance ratio. The important thing about our product is that it is not Eau de Toilette or Eau de Parfum but high - quality perfume. For some time the perfume market is one of the most stable markets in the world, almost free from unfavourable fluctuations. In other words, the perfume market is worth billions. Nearly 90 percent of people wear perfume - every day or occasionally, depending on their mood or the time of year. ISN'T IT OBVIOUS THAT IT IS WORTH USING HIGH - QUALITY PERFUME FOR MARKETING AND GAINING CUSTOMER LOYALTY ! For sure. So we offer. - and of course in packaging designed by you. Everything is customized to meet your needs and desires - at a fixed price which is a part of our offer. Quality and customer satisfaction is our hihest priority. Since 2009, we have been selling worldwide high - quality for women and men. We offer our customers the excellent price - performance ratio.